Coral fossils dating back 300 million years ago were discovered in Sơn Đoòng Cave, in the central province of Quảng Bình, scientists announced on November 6. Professor Ta Hoa Phuong from the Geology Faculty of the Hanoi University of Science revealed that the remnants of white tetra corals, measuring around 3 – 4 cm in diameter, and ancient crinoids are located in different sites of the cave with a high volume of density. Previously, biologists also found hoof fossils here, the only intact objects of its kind in Vietnam. Located approximately 500km south of Hanoi, Phong Nha–Ke Bang National Park, a UNESCO World Heritage Site, is a top destination in central Vietnam. 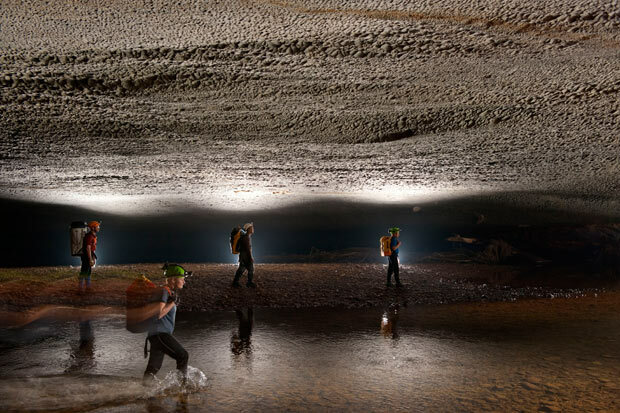 A local man first discovered Son Doong cave, which scientists believe was formed 2 to 5 million years ago, in the Phong Nha – Ke Bang National Park in 1991. The cave was later made public in 2009 by a group of British scientists from the British Cave Research Association after they extensively surveyed the area. Son Doong has a length of at least 6.5 kilometres and is estimated to be 200 metres in width and at least 150 metres in height (while its very largest chamber is an incredible 250 metres in height, enough space to accommodate 40-storey skyscrapers). It was opened to a limited number of tourists in 2013, instantly making it onto the bucket lists of travellers around the world. Recently, the New York Times named Quang Binh as one of the most attractive destinations in Asia and eighth out of the world’s 52 top must-go sites for 2014, meanwhile the US magazine Business Insider has included Son Doong Cave in the list of 12 most impressive caves in the same year.